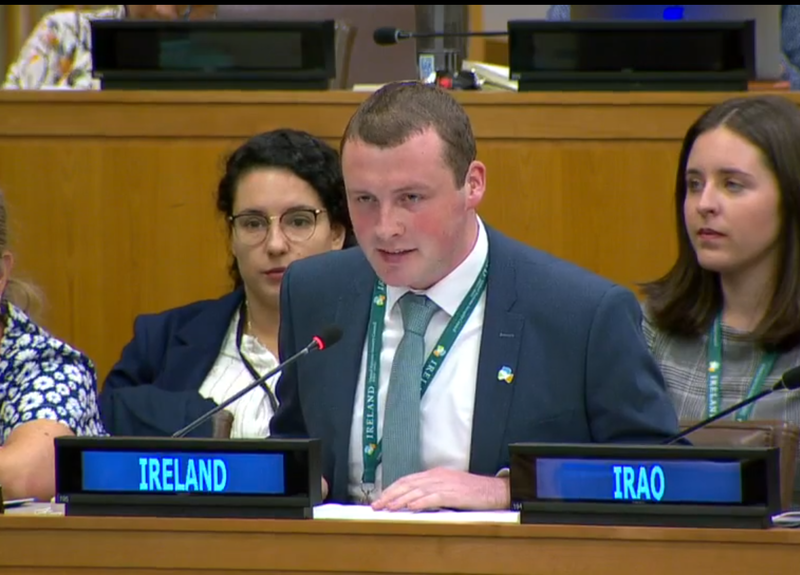 A WIT graduate, Jamie Moore from Dungarvan who was selected for prestigious role with the United Nations (UN) addressed the UN General Assembly on behalf of Ireland this week. Jamie Moore , a WIT graduate, and Aisling O’Boyle a Trinity College Dublin graduate were selected to join Ireland’s delegation to the United Nations General Assembly in New York this autumn. Achieving full gender equality by 2030 (requires comprehensive legislative and societal changes that recognise the specific needs of girls and young women). The threat of climate change particularly impacts young people. Unacceptable numbers of young people are not in education, employment or training. Young people make up 25% of the world’s population today but they make up 100% of the future. As one of Ireland’s UN Youth Delegates for 2018/19 Jamie will work closely with Ireland’s Permanent Mission to the UN and will have the opportunity to represent the youth of Ireland during sessions of the UN committee dealing with human rights issues. The programme is run by the Department of Foreign Affairs and Trade, Irish Aid, and the National Youth Council of Ireland (NYCI), which represents organisations working with over 380,000 young people each year. Jamie is from Dungarvan, Co Waterford and attended Meánscoil San Nioclás in An Rinn, is a graduate of Waterford Institute of Technology, currently co-ordinates the Fingal Public Participation Network (PPN) in Fingal County Council and sits on the National PPN Advisory Group in the Department of Rural and Community Development. The delegates will be engaging in extensive consultation throughout the year. Those holding youth events in Ireland can contact [email protected] to invite the Irish UN Youth Delegates to attend. The delegates will also address a Youth Summit as part of One World Week organised by the NYCI on November 21st 2018.